Kevin Hitchon spoke of his immense pride after joining a select group of people to captain Padiham to success. 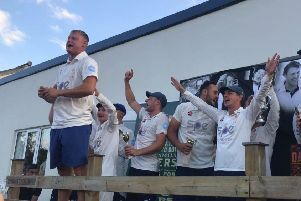 The Arbories skipper was named as the 12th man when the club last secured the Ramsbottom Cup a decade ago. But it was a completely different experience this time around as Hitchon led his side to victory against Settle at Whalley Road. Padiham, thrashed by their opponents in the Ribblesdale League 24 hours prior, reversed that form to win by 55 runs. Callum Clarke (49), professional Siviwe Gidana (34) and Hitchon (24) were the pick of the batsman as the champions posted 189. Man of the match Curtis Meehan then took 4-30 to restrict Settle and prompt wild celebrations. “It definitely lived up to expectations,” said Hitchon. “It was an absolutely brilliant day with plenty of people there supporting us. The atmosphere was brilliant, the whole occasion was superb. “It was especially pleasing after Saturday’s result where we got absolutely battered by Settle. It was great that they were able to turn it around and put in a performance like that. “At the end everyone came running on and we were mobbed. It was a very special moment. We were in a bit of a daze when it happened, it’s all a bit of a blur. 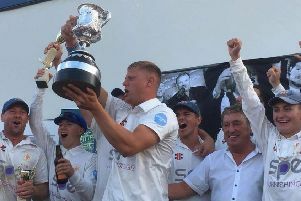 “I’ve been at Padiham all my cricketing life so to win a trophy makes me immensely proud. “I don’t think anything else could compare to this. I’m proud to have won a trophy for this club. It’ll be tough to top this; it’s a special moment in my career.